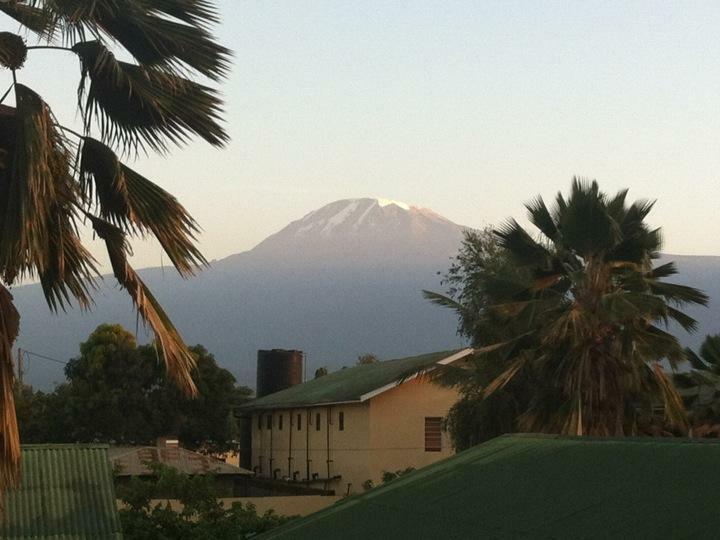 We arrived at the Machame Gate on Mount Kilimanjaro's south-western side at ten in the morning. The snow-capped peak, rising 5896 metres out of the otherwise rather flat northern Tanzanian landscape was enough to set apprehension on edge, but the day was sunny, the gear was packed, boots were tightly laced and after a quick sign in our team headed off. We were comprised of your two intrepid authors, two eighteen year old, semi-shaven haired and highly pierced Canadians, Izzy and Lisa, our guide Omari, assistant guides Daniel and Rajab, plus a cook and porters. After looking at the size of that mountain, plus hearing that ten people a year die climbing it, there was no way we were carrying all our own gear. The first crisis came when Mads forgot her medicine bag, but the guide called back to the hotel and had it delivered to the gate, for a suitably Tanzanian fee. Day 1: the first days hiking was lovely...for the first hour. We wandered at a slow pace, "pole pole" being the catch-cry of our guides - meaning "slowly slowly" in Swahili. The verdant rainforest, moss-covered trees and slight uphill walking was lovely, then just before lunch we found out why it was rather easy to book a hike only two days in advance. Wet season. The rain, incredibly loud thunder and cold wind picked up for several hours, seeing us all drenched. We huddled under a tree to eat our packed lunch of boiled eggs, juice boxes, cake and oranges. Post lunch we stormed off, determined to get warm, trying to keep up the mad pace of the porters. We managed to hold our own for a while - though they did have significantly larger packs than us, some balanced on their heads, most were a little drunk or stoned and at least one of them was climbing in yellow Crocs. In the afternoon the rain ceased, and we enjoyed the last half hour of the climb, with some spectacular views over the lower slopes. We arrived at the Machame Hut site at about 3:30, setting up camp at about 2850 metres above sea level. Not long after we arrived the rain set in again, though we figured we'd be safe in the four season tents provided to us by the climb operator. After dinner we climbed into bed, surprised at how easy the first day seemed, though the cold was noticeable. It was significantly more noticeable when Mads woke up around midnight to find the tent bottom soaked, her sleeping bag and mat wet and a stream running underneath our lodgings. We settled for sharing the 45cm wide piece of foam, called it another jenga moment, which we were hoping not to experience on Kili, and tried to get some damp sleep. Day 2: waking early and wet, we had a breakfast of toast, porridge, eggs, and the ubiquitous Tanzanian Vienna, which is just as disgusting as the Australian version. The terrain became significantly more rocky, with our six hours of hiking only yielding seven kilometers of distance. The trees began to thin, becoming scrub in amongst boulders, and by lunchtime we were in amongst the clouds. We ate another packed lunch consisting of the same spread as day 1, but this time were pestered by enormous, hook-beaked ravens, which delighted bird-phobic Mads. Nonetheless as we climbed down towards that day's camp, we thoroughly enjoyed ourselves as we hopped over rushing streams and under ice-cold waterfalls. Through the afternoon clouds emerged Shira 2 camp, at an altitude of 3810 metres, meaning that we were higher than any of us had been outside of an airplane already, and it was only day two. That night we were afforded spectacularly clear views of the summit, scaring us as the nearly full moon rose over the peak, challenging us to continue. Day 3: yet more eggs and Viennas charged our morning batteries. thanks to a combination of the head guide ensuring the tents didn't flood again and the fact we were above the rainclouds we weren't wet this time. The climbing on this day became rocks and gravel as we moved above the height that most things should, or can, live. This day was somewhat of an acclimatization day, such that we hiked up to a height of 4630 metres, to the Lava Tower, for lunch. Towards this point we all began to notice head aches creeping in, the beginnings of acute mountain sickness. The temperature also dropped significantly as we reached the pile of cooled lava, rising several stories out of the otherwise gradually descending mountain. The peak seemed nearly close enough to touch now, though it was still well over a kilometer higher than we were. After our lunch of, yep, boiled eggs, cake, oranges and a juice box, we began to descend. Our first taste of the knee-jarringly hard times came straight after the Lava Tower, as we careened downhill, with only the icy wind in our faces stopping our fall at some stages. After what seemed like an age of downhill, but was really only two and a half hours, we reached Baranco Camp, at 3976 metres. This night seemed much colder, though the altitude was similar to the night before, due to the closed in, wet-feeling clouds. We rugged up for bed, having been shown the Barranco Wall, our ominous first task the next day. Day 4: this day saw many fun things happen; the climbing got significantly harder, the altitude increased and Tom got some delightful mountain sickness. We set off up the steeper-than-expected Barranco Wall, climbing steadily for the first hour, relishing the shade as the unimpeded sun beat down upon us. By the beginning of the second hour we had begun the first downhill section, rather pleasant after the climb. Tom continued to feel sick, and burp up delightful Vienna-flavored concoctions, across the rocky landscape, until we spied Karanga Camp, our lunch point. Mads commented that it was fairly early for lunch, but within a few hundred metres we could see that we had to climb down and up an enormous valley to get there. Several curses were made regarding the lack of cable cars on Kilimanjaro, but eventually we made the lunch stop, eating at 4985 metres. Tom had a few mouthfuls of his pasta before engaging in what will be one of the more scenic vomits of his life, spewing near the edge of a hundred metre drop into the clouds. That afternoon we continued a long, slow march across barren rocklands, there were definitely no more plants to see, skirting around the peak of the mountain. After about seven hours of largely uphill battle we reached Barafu Camp, our base camp for the summit attempt. By this stage the air was becoming noticeably thinner due to the 4673 metre altitude, the wind far colder and everyone seemed a little scared when Omari told us to go to bed at six o'clock, since he'd be waking us up at eleven pm to begin climbing to the peak. Tom managed to eat a whole two pieces of dry white bread at dinner, exactly the kind of filling diet you want to be on for some freezing cold climbing. Day 5: up at eleven, we put on everything we had packed in anticipation of the freezing summit conditions. The wind ripping at the tent as we lay in bed didn't help. A few biscuits and some tea gave us a last taste of warmth before we hooded up and headed out. It's hard to describe just how hard the five hours of walking in the freezing dark, breathing becoming increasingly difficult. The mountain sickness felt like a punch to the stomach, the drowsiness left you reeling, tiredness made you want to sleep every time we stopped for a few minutes break. Rests were short as it was dangerous to let your body become too cold. The wind tore at lips, eyes and cheeks. Noses became bloodied. Tom disposed of his earlier tea and biscuits early on in the hike, deciding they weren't necessary to carry up the hill. At about three thirty we were told we were over 5500 metres, and felt a short surge of enthusiasm, though the lack of feeling in fingers and toes did damped this somewhat. Finally, just after five am, we reached Stella Point. This marked the end of the climb on frozen skree. At 5720 metres we only had just over one hundred and fifty to go to the highest point. The sun began to lighten the horizon to our backs, though this last ascent took us nearly an hour, weaving drunkenly through the snow, Tom especially being effected by 'mountain dizziness.' At 6:20 we reached Uhuru Peak, the summit of Mt Kilimanjaro and the highest point in Africa at 5895 above sea level. The sun shone richly over a neighboring peak, setting the incredible scene. Our guide dropped to his knees and offered a prayer, hugs were exchanged, an amazing sense of accomplishment abounded. We wandered about for a short while, taking in the sights of the ash crater, surrounding glaciers and the sunrise. Photos were taken, and while they look amazing (hopefully we can get them up shortly) it is the sense of achievement at working so hard to make it up that imbues the moment with a lot of its significance. The cold began to take its toll, and forced our shaking forms from the summit. The descent was tough, the skree thawing out in the morning sun became slippery and loose, seeing more than one slide down a section. We marveled as we traversed the steep decline how we had actually managed to get up these slopes. The morning sun seemed burning after the ridiculous cold of the night (even the Canadians said it was cold!) After about three hours of downhill sliding and sweating we got back to camp, exhausted and somewhat disbelieving that we has actually made it. We all collapsed for a few hours before being rudely awoken and told it was time for lunch, then we had another three hours down the hill to that night's camp. This three hours wasn't what we needed. Though we began in high spirits, adulated at the fact we had summited that morning, by the end we had all sunk into our iPods, draining whatever battery we had left to get us down the hill. We were all exhausted, feet were blistering, knees aching, lips and noses chapped, faces burnt. By the time we stumbled into Mweka camp, at the outrageously low altitude of 3068 metres, we were ready for bed. We did however all notice how easy it was to breathe, and Tom actually ate some chicken at dinner, the first none bread or watermelon meal for two days. We went to sleep to the calming sound of two British men having a snoring battle. Normally this would've been a source of severe, sleep-inhibiting annoyance, but this night we were so exhausted even these two roaring beasts couldn't keep us awake. Day 6: an early start was required to get out of the national park at a decent hour, so set off after a quick breakfast at a slow hobble. Knees were in pain all around, especially your two bloggers who both have seen a bit of trouble in these areas before. The downhill, rock hopping path made few friends and the morning was passed joking about how we all felt closer to retirement than graduation. After about three hours' descent, watching the mossy low trees once again grow into full rainforest as the air grew thicker and we moved below cloud level, we reached Mweka Gate, the end to our climb. After such a fantastic/terrible/hard/amazing six days, we found it comforting to know that Tanzania hadn't changed a bit. Within thirty seconds of hitting the car park we had been offered 'authentic' Masai swords, carvings, paintings, Kili tshirts, necklaces and all manner of other junk. We signed the guest log, continuing our habit of making up occupations, since anything is better than Tom telling the truth and writing 'unemployed', and piled into the bus. Back at the hotel we engaged in the awkward forced tipping that comes with any organized activity in this country, then given certificates stating that we had managed to summit Kilimanjaro. After this came showers - delightful, hot showers. A week of hiking grime was washed off before Tom went to battle reception over the issue of being charged twice on his credit card for our climb. Finally we relaxed. Beers and photos were exchanged with Lisa and Izzy, who were fantastic companions for the week. Not being ones to rest on our adventuring laurels, and also wanting to cram as much as we can into our remaining Africa time, we rose early the next morning, boarding a bus to Mombasa, Kenya. This is the location of this blog's authorship, as we enter the Mombasa suburbs, having sat on here for nine hours instead of the five it was supposed to take. Ahhhh Africa.